KEY WEST, Fla. -- Authentic island isolation, fascinating nautical history, alluring cultural synthesis and awesome angling action - this is Key West. A great option any time of year, America's southernmost city presents an inviting option for winter trips. Absent the vacation season crowds and incessant heat of summer, Key West retains all its charms when the weather turns cool – plus, it sees a major spike in sport-fishing activity. More on that in a moment. Whether you trailer across The Overseas Highway spanning the entire Florida Keys archipelago, or cruise into Key West Harbor, this distinctly genuine town sitting just 90 miles from Cuba will captivate visitors with an amazingly diverse island lifestyle that blends a wealth of historic sites like the Key West Shipwreck Historeum, Hemingway House and Audubon House, with an intoxicating fusion of Caribbean, Latin, African and American cultures. Stroll Duval Street's famed entertainment district, ride the Conch Train throughout the town's premier sightseeing route and watch an unforgettable array of acrobats, magicians and fire eaters at Mallory Square's daily sundown festival. When it's time to wet a line, Key West offers sizzling offshore action on the ocean or gulf side, so regardless of which way the wind blows, anglers can always find a leeward opportunity, compliments of a breeze-busting land mass. 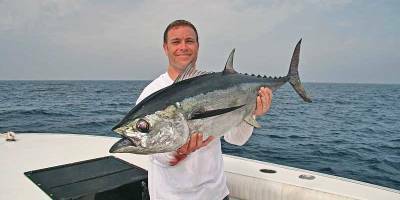 Offshore targets include kingfish, wahoo, tuna, dolphin, sailfish, marlin, grouper, snapper, cobia, amberjack and African pompano. 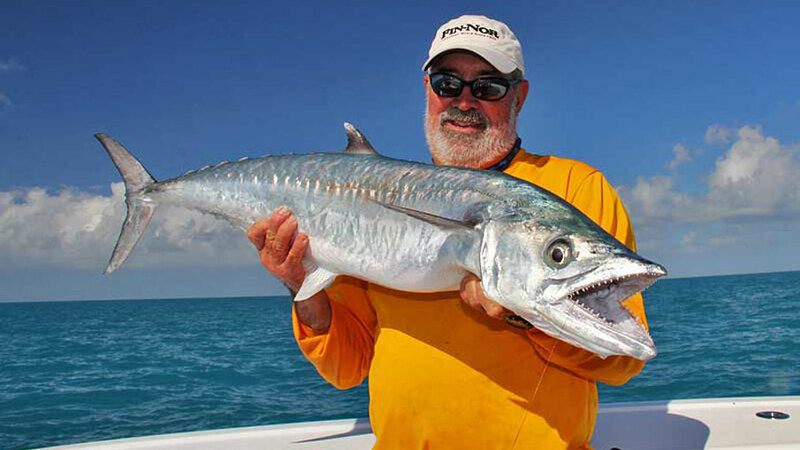 Inshore, work the shallow flats and mangrove basins for bonefish, permit, tarpon, barracuda and sharks. Fantastic fishing action spans the calendar, but Key West is particularly popular during the winter months, as the moderate temperatures appeal to visitors, as well as fish. The cooler months see a huge influx of Gulf fish flocking to The Keys to flee chilly temperatures in northern latitudes. Swept by Gulf and Atlantic currents and blessed with abundant reefs, wrecks and rock piles, Key West waters offer cozy digs with endless food supplies for anything that swims. Bottom Fishing: Anchor on a ledge, rock pile or reef, hang a chum back and drop a variety of frozen sardines and squid, along with live pilchards, pinfish and blue runners for the mix of snapper, grouper, cobia, jacks and sharks waiting below. Bucktails, diamond jigs and slender speed jigs will also tempt several of the larger species, along with amberjack. Keep a bait or two deployed on flat lines for the king mackerel, tuna, wahoo and sailfish that frequent the hard-bottom sites during winter. Slow Trolling: A popular tactic for targeting big kings, a spread of live pilchard, blue runners, rainbow runners and the like brings a buffet of easy targets across the kings' radar. Keep some near the surface and drop one or two on downriggers to cover the water column. Drift Fishing: Similar to slow trolling, but a more natural presentation, as you just go with the wind/current. Set up the proper angle to drift across one of the many reef sites and expect a knockdown on every pass. Kites enable you to position livies right at the surface where their frantic splashing draws predators to the enticing meal. Flats Mix: On a wind drift or low trolling motor power, easing across the shallow grassy flats between the smattering of small mangrove islands near Key West (or the Marquesas, 20 miles to the west) will deliver plenty of shots at bonefish, permit, tarpon, barracuda, Cero mackerel and sharks. Opportunities are many in this winter wonderland known as Key West. So pack your bags and head south. The weather's cool and the fishing's hot.